Originally built in 1897 for Mrs. Cecilia Owen, and designed by architects Theodore Eisen and Sumner P. Hunt, the home was sold to George Wilson, a capitalist who made his money in real estate and oil. In 1906 Wilson hired architects Train and Williams to design a Neo-Classical porch at the front of the house, giving it a much more formal appearance. 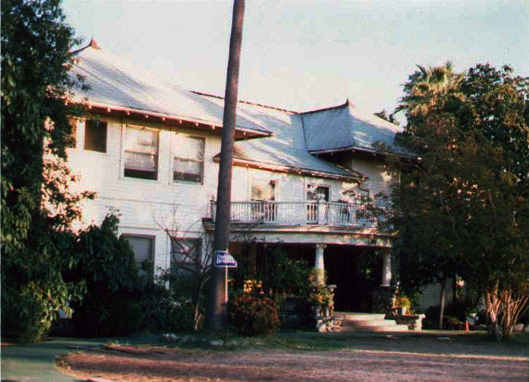 The home was converted to six interconnecting units after Wilson’s death in 1926. The kitchen, which was formerly a free-standing building, was connected to the house. During negotiations with the owner to save or move the house, it burned to the ground on December 14, 1989 in an arson fire. That day the City of Los Angeles enacted what today is referred to as ‘the scorched earth ordinance’, which prohibits new construction for five years on a property where a historic structure was illegally demolished, even if it was by a suspicious fire.